If you are looking for information on the Twin Donut franchise business opportunity, Twin Donut franchises or Twin Donut franchising, then you have come to the right place. Twin Donut has been in the coffee and donut business since 1959, and is well suited to introduce hardworking, committed, franchisees to this fast-paced and highly profitable industry. Twin Donut is a franchise that offers more than just coffee and donuts. We serve delicious hot breakfast, hot and cold lunch/dinner sandwiches, soups and salads. Twin is offering opportunities throughout all states to those individuals, groups, partnerships who would like to join our Twin Donut family. 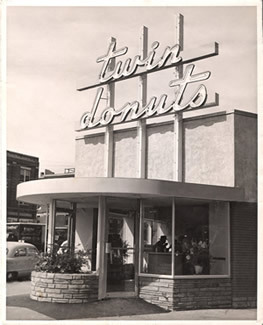 Twin Donut is a coffee and donut retailer founded in Boston, Massachusetts by George Psathas in 1959. George began in the kitchen of Dunkin Donuts when Dunkin was a local shop, rising through the ranks of baker, store manager and eventually Division Supervisor of a Quincy, Massachusetts store from 1951 to 1958. Through his work experience George learned to provide his customers' a first class donut which he knew could be, "Imitated but never duplicated," adding a great cup of coffee George began Twin Donut. George stayed true to his training by opening stores in local neighborhoods where he could provide his customers with the freshest donuts. George realized early on you must provide customers with great service. George promoted and trained his staff to fulfill each customer's orders in a timely manner with a smile. With George's business model of great service and quality product, his business flourished. He then brought his business to the metropolitan New York market and became an immediate hit in the local neighborhoods of Yonkers, Bronx, Queens, and Manhattan. So began franchising Twin Donut in New York City. Twin is seeking qualified candidates who have a desire to own their own business. With a commitment to hard work; customer service; and leadership direction Twin Donut will give you the keys to success. Site Selection: We provide prospective franchisees with our store location criteria. Our professionals will review each site based upon our criteria with you before finalizing a lease. Store Design: Our stores are designed to maximize sales and showcase our product. With our employees trained to provide great customer service, and utilize sales promotions we have created a formula for increasing sales and customer retention. Merchandise/Product: While our name suggests coffee and donuts, we provide far more. We offer salads, soups of the day, hot and cold lunch and dinner sandwiches. Twin is constantly working to refresh and update our menus by utilizing customer feedback and market research. Buying Power: Twin encourages all franchisees to buy through our preferred suppliers to obtain the best possible costs. Twin Donut encourages our franchisees to source products themselves but must meet our standards before being introduced to Twin customers. Training: Twin provides individual training for you and/or your store manager at one of our stores. 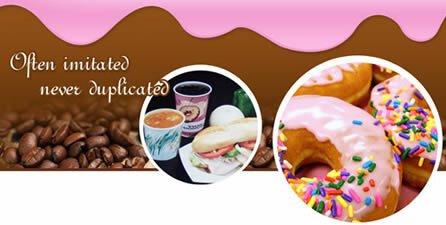 Marketing: The Twin Donut marketing department promotes our brand through sales promotions and advertising. Our franchisees are expected to promote their store under the guidance of the Twin Donut marketing plan. The Twin Donut support staff communicates on a regular basis with our franchisees to ensure all procedures are being followed. We encourage franchisees to communicate with our corporate staff to provide suggestions and feedback to what we can do together to grow the brand and increase sales. If you like what you have read and are looking for an opportunity to join a growing franchise, we invite you to fill out an application and be a part of the Twin Donut family. With hard work and a desire to succeed, Twin Donut will provide you with the building blocks to financial success!